At the start you get given a choice, either to go through the tutorial or not. Go right to go through and left to not. Going right through the tutorial section jump over the obstacles and up some steps to where you get told about double jump. Keep on going further to the right and drop down at the end. At the bottom jump onto the platform in the air to the left and glide left to another platform. Next jump down the drop beyond it and continue on at the bottom. Presumably the game tells you to look up so that you don't waste your time going up to the dead end. Drop down the platforms to where the game tells you about looking down. It's not a very useful tool as it barely shows you anything but can help occasionally. Jump down onto the platforms diagonally to avoid the spikes at the bottom on the right, head out to the left at the bottom. From the top of the steps jump and glide onto a wooden platform to the right and then glide right again. From this solid land glide once more to another similar looking part of the level, you might need a bit of a run up to make it. If as it were some kind of pattern you now have to glide again, onto a wooden platform in the middle of the path and then off it again. Next up is learning how to use your melee attack, the first thing you get to use it on is a green gem crystal, smash it to get some green gems that you probably don't really need at this point yet. Just past the gems is your first enemy, a Rock Rat. It's worth noting that you can just ignore the majority of enemies, just jump over them and keep moving. Keep on going right and you'll learn about heavy attacks, then how to use your many breath attacks. They even give you another couple of Rock Rats to try it out on, just don't use the breaths with a blue shield underneath as that means the current creature is invulnerable to that element. A red target means that your attacks will do double damage. Once you've killed them continue on towards an elemental door. It may not be entirely obvious which element is required to pass this part but for all doors that look wooden with spikes on you use Fire Breath. If you can't guess by looking at it then trial and error is always an effective option. You might want to stand back as it burns. Go through and step into the blue circle to trigger a cutscene and move into the next part of the tutorial level. Next up we learn of the elemental strike, the close combat elemental equivalent of your melee attack. You can use the same combo moves as with the melee attacks, the only drawbacks being that some enemies are immune to certain elements and it drains your breath bar just the same as using the breath attack. Kill the Rock Rat just ahead and then refill your bar (it auto regenerates slowly anyway (it's quicker when not the active character)) with the gem cluster. Another elemental door up ahead, you should be able to work out that it requires Earth Breath to be used on it since it's made of earth and has grass growing on it. Drop down the new gap and continue right where you'll meet a new enemy a Blue Sprite. Use your Fire or Poison element to help defeat it quicker as it is weak to those two but immune to Ice, Earth, Shadow, Wind and even your melee attacks. Jump down at the end and go left at the bottom. Along the path you'll meet another Sprite, this one is a different colour however (Green) and has a different weakness set. Use Electricity or Fear on it to kill. Drop down at the far left and head right. Kill yet another Rock Rat followed by a Blue Sprite, then another Rock Rat before you get to a section where you are required to switch to Cynder. The only point in the game where you need to be one character or the other is to get by an elemental door, apart from breath attacks both characters are identical (until you start picking up relics) and are best used when your current character is low on health or breath. Switch to Cynder and use Fear breath on the door (because it's red and red is an easily scareable colour?). Just after the Fear Door is yet another colour Sprite, an Orange Sprite. Kill it with Wind or Ice. Continue onwards to a moving lift, get on it to get up to move on at the top where you'll find a blue gem cluster. Blue Gems are used to upgrade your breath attacks so that they're stronger and do more damage. Just past the cluster is a platform to drop down through hold down and jump to get past. Kill another Rock Rat and then jump upwards through some smaller platforms (ie ones you can jump through) and go right at the top. Now we learn how to wall jump, you need to hold towards the wall when pressing jump. Go up and do it again to the left, then perform a series of wall jumps at the next part to get to the end of this part of the level. Ahead you'll find a Rock Rat followed by an Orange Sprite. Jump down the gap and go left, watch out for the two Yellow Goblins at the bottom. The Yellow variety have no particular elemental weaknesses or immunities so you can pretty much use anything on them. Drop down the platforms at the end and at the bottom go right past a Rock Rat. Jump to the platform in the middle of the water to the right to collect the first Green Mask. Picking up these will increase the breath bar but only for the character that physically collects it. You'll have to make a decision each time you find a mask as to who gets it. You can focus on getting one character brimming with power or spread it out over the both of them. Once you've picked it up continue on to the right and jump up towards a Goblin on a platform above the path. Continue on this platform and jump up the step to the right. Jump up the platforms in the air to the top right corner. Kill the Goblin and Rock Rat in your way heading to the far right past a waterfall. Jump over a platform, kill another Rock Rat, ignore a moving platform (well, you can go up and kill a few enemies if you want but it's a dead end otherwise) and drop down three thin platforms to the right. Continuing right you'll need to jump over water to where you'll fight a Rock Rat and Orange Sprite at about the same time. Keep on going over the water (falling in water is an instant kill) and then up a wall jump section and to the left. The game will teach you charging now in a safe spot, then after a wall jump you get to use it for real. Charge along past the falling rocks which, if you time it right, you'll not get hit by if charging. Right after the rocks is another Orange Sprite you can just charge on past and then be given some blue gems. Jump over the gaps and keep moving right as you go, a few of the platforms will start to crumble as soon as you set foot on them. Once you've passed them all, jump up a small step, charge past some falling rocks and learn to backwards dodge. Kill the Yellow Goblins and continue jumping right all the way to the end of the level. And now, the flight section. Unlike the console games the flight in this version is limited and directed. Spyro (or Cynder if you switch) will fly forwards constantly all you have to do is make sure he avoids obstacles with the dpad and to shoot enemies with the stylus. Spyro's attack requires clicking for each enemy whilst Cynder's you can hold down and it'll fire a beam of poison constantly. Cynder's is the one I recommend using the most. This is also the point at which you may want to switch the Y-Axis depending on your own preference for controlling the flight. Normal has Up making you fly towards the top of the screen whilst Inverted has Up making you fly towards the bottom. You can also switch to left-handed flight using the ABXY buttons as a dpad. You'll eventually reach your destination. The introduction gives you some subtle hints that you're going to want to hit those purple bits. 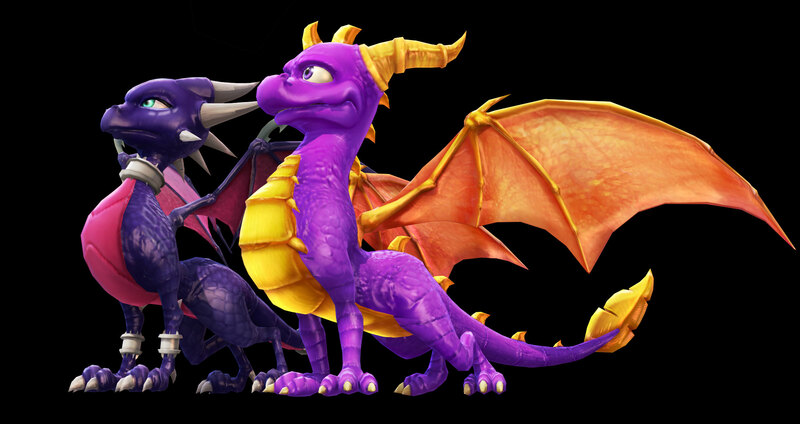 Again Cynder's attack is the easiest way to attack but Spyro's can be of use too if you rapidly fire it accurately. Avoid the Golem's attacks and whilst the purple bits are glowing and making a sound use your breath attack on them. Try and concentrate on a single shoulder at a time, once the four crystals on his shoulder have been smashed you need to finish off the arm with one more attack. This will remove his arm and start a new sequence of attacks. He can still swipe at you with his single arm but it's easier to avoid than the double attack the Golem did before. He will also now start firing a laser burst out of his eyes, avoiding it is a lot easier too. Finish off the other arm and then turn your attention to the crystals in his lower region. Avoid the laser bursts by flying from side to side while attacking him, again after the four you'll need to hit him once more to defeat the Golem. If you're having trouble and are being made to watch the same intro over and over you can skip it by pressing A. Just to the right of the start you'll find a Green Goblin which you'll not want to use Earth or Wind on. Drop down the gap and go left and down through the gap. Drop down again to the right and kill the pair of Green Goblins on the floor. Take the moving platform just past them and to the right at the top. Across from you is a Yellow Orc Archer. Avoid its arrows as you jump towards it to kill it. Drop down through the platforms to the solid ground and head to the left (you can jump up through some platforms here to get some Blue Gems), go down to the right and kill yet another Green Goblin. Jump over the crates and onto the lift, you can go up to kill another Orc Archer, down just underneath where you walked along to kill a Green Goblin, down below that to a normal Yellow Orc. The way forwards is at the bottom to the right. Head up the steps and kill the Archer at the top. Wall Jump up to the platforms above you. Jump to the right and over some small platforms to a Goblin Messenger which you don't want to use Fire or Poison to attack with. Keep on going right and down to the blue circle, guarded by a Yellow Orc. Head right and jump over the platforms in the way to get to a Yellow Orc. Pass by and jump up inside the building and up through a thin platform to a Green Goblin. Once you've killed it jump up onto the crates on the right (jump up to the right for some blue gems) and down to the right. Drop down into the well. Go left and make sure to land on the crates in the green water, don't fall in! Kill the Goblin and the one down beyond it to the left. Keep going left down and then to the right. Jump over the obstacle to get to a closed gate (blue gems above!). Use your Electricity Breath and hold it for a short time until the gate starts opening. Go through the gate and kill the Green Goblin standing in your way. Go through the passageway behind him and collect the Health Mask (remember to select the character you want to gain extra the health). Just after the Mask is a Green Orc Archer which is immune to Electricity and Poison. Now wall jump up the small gap above you at the end all the way up and out. Jump up to the right then left and up the slope to beneath a Green Orc Archer. Jump and glide to the right and land on some platforms in the air. Jump to the top and up the slope to the right. Finally up through the thin platform and to the left. Here you'll meet a big Guardian who is immune to all elements. What this means is that you can only use melee on him so run up and start whacking away. If you've got low health when you go in you might want to try dodging backwards after a few hits then going back in, but otherwise just ignore the hits (unless your health gets very low of course) and hit away until he dies. Once he's dead walk past and melee the lever on the floor. Head right and you'll be shown some locations you need to get to; three pillars and two blue circles. Keep on right, jump over a gap onto a wooden part of the level, just ahead you'll meet a Shadow Ape, kill it with fire. Wall Jump up the wooden parts above where the Ape appeared and go right at the top. Drop down to the right making sure to glide a little to avoid a gap at the base. Kill the Blue Goblin and Bright Yellow Orc and carry on right. Jump up the wooden platforms and go right when you can. Kill the Goblin Messenger and then use Electricity Breath on the gate at the end. Go into the blue circle. As before you're shown your target, a single pillar. Go right down the steps, kill the Goblin Messenger as you go. At the bottom stop. Watch the rising and lowering pillar in the water and prepare to jump onto it as it starts going upwards. Time it so that you land as early as possible to give yourself enough time to run along four pillars all of which are going at the same rate. Once you make it Wall Jump up and kill the Bright Yellow Orc. Go left and up a couple of moving platforms, jumping when they reach their highest points. Kill the Shadow Ape as it appears as well as the Goblin Messenger that flies down to you. Wall Jump up onto the moving platform above you and glide along onto another to the right. Jump off and kill a Bright Yellow Orc and Blue Goblin pairing. Jump up the wooden platforms to the right and Wall Jump up to the top. Kill another pairing of Orc and Goblin whilst heading left past another Goblin Messenger. Kill it and continue down to the left and kill a Shadow Ape and Blue Goblin below. Continue right to a water blockage. Use Ice Breath on it and then melee to get past. Once past melee the pillar to destruction. Turn around and make your way back out of this area now, drop down at the point of those two rising moving platforms and glide to the left to avoid those four submerged pillars. Jump up to the left past the Goblin Messenger and Wall Jump between a wooden and stone section. Jump to the right and make your way upwards. Heading left kill yet another Shadow Ape and the Blue Goblin behind it. Jump onto the top of the water pipe and then up to the left. Yet another Goblin Messenger to kill. Keep on left, another Shadow Ape and a Blue Goblin down the slope past it. Jump down to the first step down and then Wall Jump upwards all the way to the top (another Blue Goblin awaits). Head left through the blue circle. Another display is made. Go left down to the Blue Goblin and up again at the other end. Go left over the stone protrusion and then jump down the gap and head left. Take the lift down and kill the Bright Yellow Orc to the right. Keep on heading right until you reach another waterfall blocking your way. Ice it and smash it. Glide over as much of the next wooden part as you can and collect the Green Mask, again remembering which character to switch to. Go down the wooden platforms (if you did initially fall you can go back up them) and down the slope headed right. Kill the Bright Yellow Orc at the bottom and then go left jumping over the gaps as you go, mind the Goblin Messenger at the far end. Smash the pillar in the wall at the end. Wall Jump up the wooden platform and make your way up to where there's a lift (and a Blue Goblin of course). Take that lift up and then Wall Jump your way up to the top. Go right past another Blue Goblin, a Goblin Messenger and make your way to drop down next to the entrance, or rather exit in this case. Head right, kill the Goblin Messenger and Bright Yellow Orc and jump along to the next barrier to smash. Jump over its remains and down the other side. Kill the Bright Yellow Orc and continue on right to a Shadow Ape. Drop down and head left past him. Kill a Bright Yellow Orc, jump up and smash a Green Gem Cluster, keep on heading left over the platforms and water pipes until you reach the fourth pillar. Smash it. Jump over it and drop down to the left. You might recognise this from a bit earlier. Continue down to the left and instead of Wall Jumping upwards continue downwards. Head down the steps and smash that final pillar at the bottom. Flying as before, there's very little to say here other than do what you did before but shoot a bit more. Avoid the falling rocks by watching for the disturbance that they cause above you, you should be able to see a few small falling rocks which tell you where there will be a large rock in a moment, avoid them for obvious reasons. Once you've avoided the rocks start attacking the glowing purple crystals on the heart and then the heart itself when it turns a solid pink colour. Repeat until the outer casing smashes. Then it's a case of doing the same thing again except that rocks will continue to fall while shooting the purple bits and the heart doesn't glow pink, it just stays black waiting for you to attack. Repeat this until the health bar is empty. And now the flight out. Avoid rocks as you go. Head right down the slope towards a Red Orc and a Yellow Wyvern. To avoid the Orc's immunities you can't use Fire or Fear but the Wyvern will be fine with whatever. Go up the steps and continue on going right until you get to a pair of Red Orcs. Once you've killed them look at the ground just past them, you should be able to see a thin bit which you can drop down through. Do so and head left down here and you'll find a Red Mask to upgrade your health. Turn around and jump back up and out. Go on with the level to the right. Kill another Red Orc and a Yellow Wyvern just beyond it. Moving on jump to another Red Orc, jump over to another platform past it and kill another Yellow Wyvern and wait for the moving platform down to the right to start its rise up, jump onto it and off again to the right straight away. Keep on headed right, killing enemies until you reach the inside environment. You can go to the right here, kill a few enemies, pass through a Earth Breath Floor Door and go around in a large circle back to the entrance of the cave, the point seems to be to get some blue gems just above the entrance. The main direction is straight down but then you get a choice. You can go right and over some crumbling platforms and then up a few platforms to the exit of the area. If you fall or decide to continue down to left you can find more enemies to kill and have to time a jump over a rising platform in the lava. Make your way to the right at the bottom and then up some thin platforms to the blue circle. Head right and up to a Red Orc (jump up back to the left to smash a purple gem cluster) and carry on right. You can either wait for the column to rise timing the jump to get over or you can just glide straight on to a platform with a Blue Wyvern hovering over it. Keep on going right, kill another Red Orc, and you'll reach a spot where you have to jump on tiny platforms on the lava. Time your jumps through the falling rocks so that you jump right as the rock hits the lava, this should get you through without incident. Jump up the platforms at the end and through the thin platforms. Heading left now run on all the way to the other end, killing the Shadow Apes that appear along the way. Wall Jump up the end and continue on to the right at the top. Kill two more Red Orcs and you'll reach a large lava gap, this one you can't make it without using the rising column. Time to land on it as it goes up and jump across to safety. Going right, kill another Blue Wyvern (drop down the gap here for a purple gem cluster) followed straight away by another. Just inside you'll find another of those large Guardian creatures. Run up to it and melee. As long as you have a lot of health you should be fine. Continue on to the right, kill a Red Orc and Shadow Ape as you approach them, and jump up onto the platforms going left at the top of the slope. Kill another Red Orc and a Shadow Ape before using the wall at the end to Wall Jump up onto the platforms above. Kill the Red Orc up top and carry on right until you get to where the above platforms stop (or continue onwards to get to a purple gem cluster). Jump up and use the wall above to get up onto those platforms. Head left and at the highest one stop (continue along some crumbly ones to reach some blue gems via a wall jump), jump upwards and try and use the wall to the left to Wall Jump up to the right. Head up the slope and use Cynder's Fear Breath on the red gate blocking you way to the blue circle. As usual head right, jump over the lava gaps and just generally going right killing the occasional Blue Wyvern until you reach a Yellow Orc Archer. Carefully jump down the other side avoiding the spikes below. Jump over the lava until you get to a point where you're on a high column above lava. When you reach the last one wait for the columns ahead to just start going up before leaping onto them and over towards solid land. Kill the Red Orc waiting for you here and go up the bridge, watch out for the spikes at the end. Keep on going right until you reach a Blue Wyvern and a very large Guardian. Draw the Wyvern off to kill it first before going back to kill the Troll. Use some long range breath attack to hit it until you run out of breath, switch to the other character and run in the elemental melee attack him until he collapses. Jump up to a Yellow Orc Archer to kill him, then up onto the platforms hanging by chains (jump across to an alcove to get some blue gems). Continue upwards weaving your way to the top where there's a Red Orc. Glide to the right at the top and kill another Archer. There's another large Troll up ahead for you to kill right after yet another Red Orc. Jump over the spikes and take on a pair of Red Orcs before jumping up to another Archer. Kill him and then wait for the column in the lava to begin rising to jump on it, the usual method. Repeat with a pair of columns right afterwards and then glide over a load of spikes. Kill a Blue Wyvern and Red Orc combo and then use a wobbly platform to get to a Yellow Orc Archer. Continue onwards jumping over another wobbly platform right into the path of another Troll. Once you've killed it cross the bridge to the blue circle of safety. Time to fly. If you haven't gotten the hang of the flight sections yet, then just keep trying until you do. Head right along the platform and jump the gap. You'll run straight into a Yellow Orc and a Light Blue Wyvern, if you jump over the Orc and head a bit further to the right you'll be able to attack them one at a time. At the far end of this same platform is a new Orc, a Light Blue one. Continuing on going right jump onto a slope and then you kind of have a choice here. If you don't want to bother getting a Red Health Mask go down before the roof and the path is relatively easy, go up onto the roof to go the more difficult but rewarding way. You might also find yourself on the lower path if you fall from the higher one, you can either go all the way back to the split point or just carry on to the end and forget about the mask. I'll be describing the more difficult path. Right as you get to the end of the roof you'll be attacked by another Light Blue Wyvern, kill it and continue on going right until you reach the end of the platform. Wait for the moving platform to arrive and jump onto it, as it goes along jump onto the first obstacle and then just ignore the platform. Jump straight onto the next tiny platform and then onto the arch piece to the right. Wall Jump up the vertical platforms on your right and drop down onto the grassy platform beyond. Wait for the moving platform here and use it to jump onto the first tiny platform blocking the path. Jump up to the right and then further up to the top of a stone structure. Jump over the hole in the middle of it and drop down to the right. Jump down to another similar stone platform where a Yellow Orc will run up to you. Kill it and go right, there's a Light Blue Wyvern at the end, kill it and go down the sloped column. Kill the Light Blue Orc at the bottom and stop at the very end. Use the moving platform to wall jump upwards, at the top jump beyond the platform to the right, you'll need to time it so that you keep jumping upwards without falling down. Wait for the moving platform and ride it until you can jump off onto a black stone platform. Keep moving right as this will collapse, Wall Jump from the lower platform sticking out to get on top of it. Jump up to the right where you'll get the Health Mask. Once you've got it drop down to the right and make your way to the end, Wall Jump up the walls at the end and drop down onto a downwards slope beyond. Drop down at the end and you'll rejoin the other path. Continue heading right, kill the Troll and drop down the hole. The game will show you a set of three doors, blue, red and green. Head left and, after a couple of lines of dialogue, you'll come across a Light Blue Orc and a Red Goblin right behind it. Kill them both and then drop down the wooden platforms at the far end to the bottom and go right. There's a few more Goblins and another Orc to kill before you reach a point with some moving platforms. Jump on the top one and let it take you upwards. Jump off to the left above the path you were just on and then jump up onto the first platform on the ground. You can go left along them to get some green gems but otherwise go up to the right where you can Wall Jump upwards towards a red arrow pointing to the right. There are a few arrows dotted around the level that will point you in the direction of their colour switch (purple is an arrow to the doors). Head into the blue circle. Head to the right and jump along the platforms until you reach a Light Blue Orc and a Blue Wyvern. Kill them both and carry on along this platform until you start going down a slope. Here you can go three ways, two are dead ends. If you drop down and head left you can find a single blue gem cluster, there's a few Shadow Apes inbetween. Heading down to the right is just a dead end so head up to the right. Kill the Blue Wyvern and jump along the platforms past another Orc and then up a slope where a Shadow Ape will appear. Jump over the gap and kill another Wyvern on the grassy slope. Straight away you'll find another Orc and a Wyvern backing it up. Kill and then continue past. Head inside up the slope and jump to the left at the top of it. Standing on the small pile of bricks jump up to the right and then up onto the platforms sticking out of the wall. Keep going up to the right until you can jump up through the floor above you. Kill the Orc there and head upwards, either end of this area is the same. Jump up onto the platforms above this and you'll make your way to a pair of Light Blue Orcs. Kill them and head towards the right side of the level. Jump up the platforms and Wall Jump to the top and head left, kill the Shadow Ape that appears around here. Kill another Ape before going down some stepped platforms, if you jump over the large gap you can get some more blue gems, otherwise just drop down and head left. Cross a small bridge and kill the Blue Wyvern hovering around there. If you drop down after it you'll find a Green Magic Mask. Jump back up and continue left following the Red Arrow. Grab the Red Gems if you're a bit low on health as you're going to need to kill a Guardian, the ones immune to all elements. Kill him with melee and melee the red button behind him. That's one door open, two to go. Jump onto the top of the button and head left all the way back into the main part of the door area. Drop down to the left onto the moving platforms. Jump off the top one and wait to get onto the one below it. Go right at the bottom (following the green arrow), kill the Light Blue Orc and the Light Blue Wyvern after it. Kill another Wyvern and a Red Goblin before you get to fight a Troll. Kill it in the usual way and then the Wyvern past it. There's another little Goblin and a Wyvern stand between you and a Guardian, remember you can only melee these. Burn down the spiked door and hit the green button to open the green door. Now turn around and head back to the moving platforms, follow the purple arrow to the left at the bottom this time. Head left, kill a couple of Red Goblins and drop down at the far end. Keep following the purple arrow by heading right, kill another Goblin and once you reach a drop go down and head left. Going up to the right will take you to a Light Blue Orc and going down to the right will take you to the Dragon Doors, you're still missing one door though so go left. Heading left kill the Green Wyvern and head down the stone slope. Drop down at the end (up doesn't go anywhere) and you'll be on another slope. At the bottom of this one jump to the next platform and then next and you'll find a Bright Yellow Orc to kill. At the split in the path the main way to go is to continue to the left, but if you go up to the right you can kill another Green Wyvern and get some blue gems from a cluster. Kill a pairing of a Red Goblin and a Green Wyvern as you continue left. Kill a pair of Bright Yellow Orcs and hop aboard a moving platform at the far end. Jump off at the top to the right, kill the Green Wyvern and then Wall Jump on the right. Head left on the layer above and kill a pair of Bright Yellow Orcs. Jump over a gap, make sure to double jump after hitting your head on the platform above you, head down to the left below the platforms and kill a Guardian. Use Cynder's Poison Breath on the vines behind the Guardian and go up some steps. Jump onto the green platform on the right above the steps and up onto the roof where the blue switch is. Hit it to open the third and final dragon door. Head back through the section to the main part of the level again (there's a different path back that doesn't seem to serve much of a purpose other than to kill some more enemies) and head through the now open doors. Zigzag your way downwards to the left and drop down through a crumbling bridge. Down at the bottom you'll need to fight off a couple of Shadow Apes and a Red Orc. Head to the right and you'll meet a Troll. Once you've killed it charge to the right, to avoid the falling rocks, and jump over a lava river. Kill the two Red Orcs and a Blue Goblin just beyond them. Wall Jump up a fair distance and then attack a trio made up of a Shadow Ape, a Blue Goblin, and a Red Orc. Head to the edge of a bridge and jump over the gap right after a boulder falls from above. Start running to the right as you land to try and avoid more boulders, keep going until you reach a Blue Goblin. Kill it, a Shadow Ape, a couple of Red Orcs, and another Blue Goblin. Then continue going right and jump onto the moving platform. Jump off to the side at the top, wait for another platform to lower down and jump onto that. Jump off it to the left and then Wall Jump against the rock above you to the right. Continue Wall Jumping up to the top where you get to a large yellow glowing gate. The breath to use is Cynder's Shadow Breath. Kill the last Guardian and go into the blue circle. Although beforehand you might want to upgrade any elements you can as this is the last point in the game before the final boss fight. Head to the right past the gem clusters (leave them) until you spot Malefor. Approach him and melee attack along with your highest level breath. Try and avoid getting hit by his own melee attacks when you're in close by jumping up as he removes his wing from blocking your attacks and melee whilst you're up in the air. You should manage to get through without getting hit. If you do find yourself running low on health or breath you can go back to the clusters to regain it. Once he takes off and hovers above the purple foot run in and melee it. Keep meleeing it, move out of the way when Malefor throws a breath attack at you, until one of the toes smashes. Now run back to the left to avoid being squished by Malefor when he lands. He'll start walking to the left and stop a bit further to the left than he was when you first arrived. Repeat the same attack pattern as you were doing originally and then smash another toe off the foot again. Keep doing this pattern, he'll get closer and closer to the crumbling platforms each time, until the foot has been destroyed. Time for a 3D fight. Using Cynder (easier breath just like in the flight levels) destroy as many of the floating purple crystals as you can. Then attack Malefor's glowing purple gem on his necklace to hurt him directly until he's at three quarters health. You may need to cycle through these attacks before he falls down. On his next loop he'll insert fireballs after the floating purple crystals and there'll be a section where the crystals fly at you. At half health there'll be an ice attack as well. He'll fall once more with a tiny bit of health left. On this final sequence he'll just do more of the same again, you'll just need to smash more floating crystals before his gem glows. Once this final sliver of health is gone that's the game finished. Congratulations. how do you get past the big door. someone please reply now because i can't get past the horn and door thingy. I need an ansewr(LIKE NOWWWWW!). I tried blowing until the door was fully open, but it barely even opened. There is a complete walkthrough of the Catacombs console level in the console section, this part is for the DS version. To answer your question though you just need to keep blowing until it is fully open. I like soooooooooo need to know how to get past the door and the horn thingy...so how do you get past it because if you try the front side blowing in the horn and try to get the other character past the door, you can't get that character past the door even though its close enough for that character to get through.So like i really reallyreally need to get past that door and horn thingy!!!!!!!!!!!!!!!!!!!!! In answer to your question, A Blue Dragon, all you have to do is use Cynder's Shadow Strike to go underneath the gates with the faces, then pull the lever! Had me a bit confused for a while, too. Good luck! Hi I have the wii version and i am in the 3rd area of the warfang ruins, how do you get to the levers behind the purple things with faces?